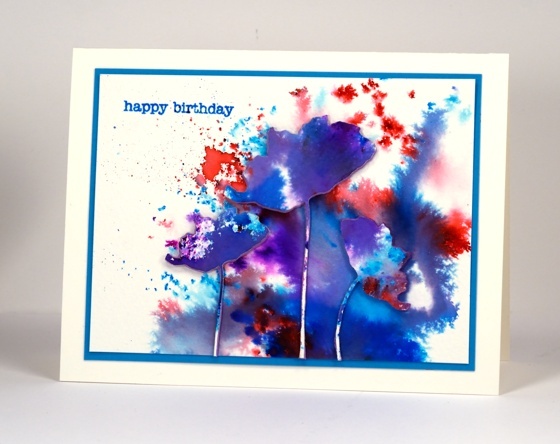 This watercolour powder experiment displays on one card some of the different effects you can get with color burst powders. Depending on how much water you add you can get fine dots of colour or very watery blends of colour. I sprinkled the powder on a piece of watercolour paper and spritzed lightly at one end but more generously at the other. The fine dots must have got hardly any water, the little irregular shapes a bit more water then the purple and blue areas were fairly saturated. All the purples and shades of blue came from only pink and blue powders. I die cut poppies from the watercoloured panel and some from foam as well then attached them all together with stick it adhesive. WOW what aburst of brilliant colors, I love taht. Fabulous. I’ve been playing with my Brushos lots but not tried die cutting from it yet… Maybe the next playtime? Are the brushos and bister the same thing?